Believe it or not, until yesterday I never cooked a potato. But potatoes are great for a heart-healthy diet. They aren’t really high in calorie, have almost no fat and have a good amount of fiber. Yet they are very satisfying. They are great for a plant-based diet. So I spent some time searching on the Internet, and found what has to be the most drop-dead (pardon the expression) easy way to cook a potato. 1. Scrub the potato (i.e. wash it really thoroughly), but don’t peel it. 2. Poke it 4 or 5 times with the tines of a fork. 3. Put the wet potato on a plate and microwave on high for 5 minutes (don’t cover it). 4. Turn it over and microwave for another 5 minutes. Be careful, because it is VERY hot. But you have a perfectly cooked “baked potato” where the skin is firm, not soggy, but the inside is soft and moist, just like you like it. And you haven’t boiled out valuable nutrients. I couldn’t believe it was that simple. This is the potato I made yesterday. 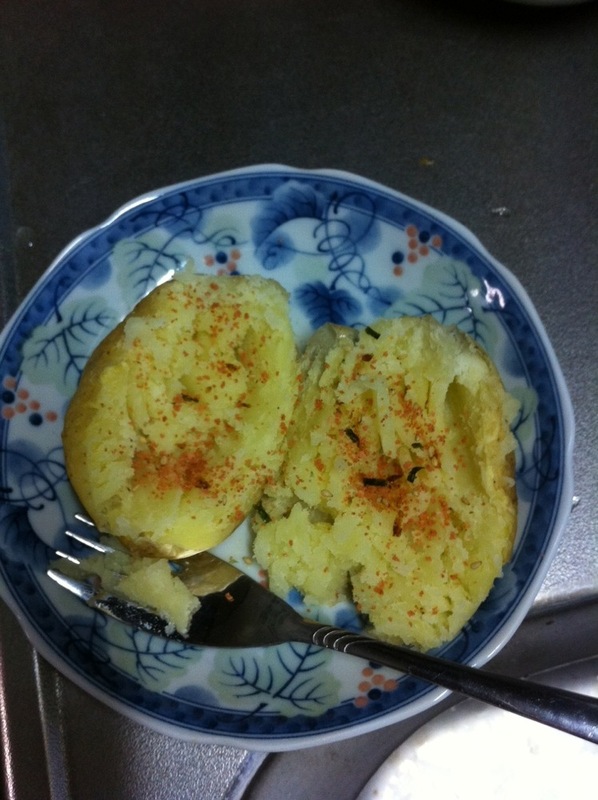 It was a good-sized medium potato weighing 200 gm, which is just 186 calories, almost no fat, and 4.4 grams of fiber. I added some Japanese furikake to it for seasoning (that’s really meant for rice, so it must look strange to my Japanese friends) but it was very tasty. Next time I think I’ll top it with some salsa.